American Lieutenant Bernard Bail was shot down on his twenty-fifth flying mission over Germany while navigating a squadron of B-24 bombers. Seriously wounded and taken as a prisoner of war, Lt. Bail is brought to a hospital where during his recovery he and a young German nurse fall in love. Through the miracle of living in the face of what should have been death, Bernard Bail discovered the spiritual; and through his experience of the pain of war, he embarked upon what became a lifelong quest to heal human mental and emotional suffering. This true story of a young World War II Air Force officer also illuminates the journey of a brilliant mind at the deepest levels of self-exploration. 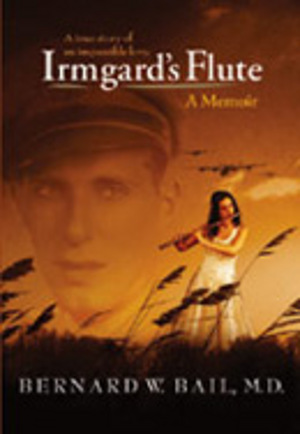 A complex and profoundly moving book, Irmgrard's Flute memorializes a many-faceted love, one that truly transcends time, place, personality, and nationality.